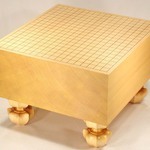 Know Thyself You may not require an expensive go board if you have just begun your journey on the path of go. 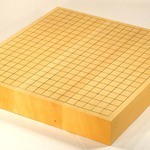 Even standard go boards will last you a long time provided they are crafted well. 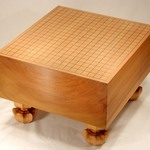 As you progress you will come to understand, and perhaps more importantly "feel", what makes a good board. 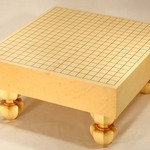 It's not too late to acquire a better goban then. The path of go is long. No need to rush in. 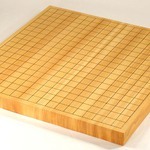 Know the craftsman Despite the simplicity and uniformity of their design, go boards require extremely specialized skills that take a lifetime to master.Great go boards are made by such skilled craftsmen who put their heart and soul into their creations. 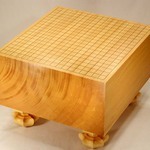 Finding a good craftsman is perhaps key in enjoying a lifelong relation with your goban. Honest and trustworty craftsmen who take pride in their works will not hesitate to help if your go board ever needs repair. Know your wood The same species of tree may produce vastly different wood depending on the location and condtions they grow in (this is why go boards require the labeling of origins just like food products). 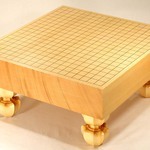 Also, the price of a go board is determined by the type of wood and its origins since they have such a great effect on the overall quality of the board. 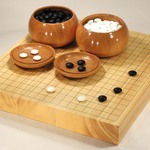 You should take careful note of the the type of wood and where it was taken from before you purchase a go board. 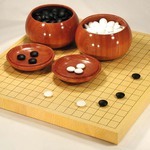 It's also a good idea to find out the market price of go boards of similar quality. 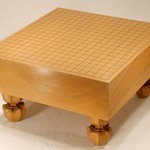 Your relationship with your go board may last an entire lifetime. Remember that wood is alive and that it will mature with you as long as you treat it with love and care. 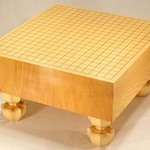 Even if your go board starts to show a little wear and tear a good craftsman can easily restore it to its original splendor. 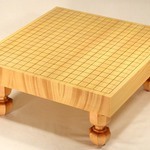 We hope you may find a go board worth treasuring, and that you may pass down through succeeding generations as many Japanese go enthusiasts did the days of old.